Delta Air Lines, the largest US carrier, is planning to take over Sir Richard Branson's Virgin Atlantic, The Sunday Times yesterday reported without citing any sources. 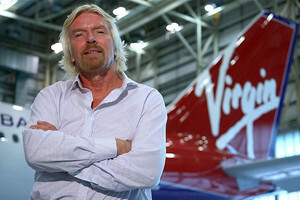 Delta offered to buy Singapore Airlines' 49-per cent stake in Virgin, and later, Delta's European partner, Air France-KLM, may buy part of Branson's 51-0per cent stake, which would see the British flamboyant business magnate lose control of his carrier that he launched in 1984. But the acquisition will to comply with European Union ownership rules, which states that a non-European company cannot own majority stake in a European carrier. To comply with this rule, Branson may retain a stake, and would, together with the Air France-KLM, hold more than 50 per cent of Virgin Atlantic, the report said. Branson, the fourth-richest man in the UK, has been mulling the airline's future for years and had in 2010 hired Deutsche Bank to explore offers. Delta and Air France-KLM is reported to have come close to a deal in February with Virgin Atlantic, but the transaction was called off over price and Branson's rights over the Virgin brand, the paper said. Crawley, West Sussex-based Virgin Atlantic operates Airbus and Boeing wide-bodied jets between the UK and North America, the Caribbean, Africa, the Middle East, Asia, and Australia. In 2011, it carried 5.3 million passengers,and reported an annual operating loss of 80.2 million on a turnover of 2.74 billion. Atlanta, Georgia-based Delta Air Lines is the world's largest airline in terms of fleet size, revenue passenger-kms flown, and scheduled passenger traffic. With a fleet of more than 700 aircraft comprising of Airbus, Boeing, and McDonnell Douglas, Delta Air Lines operates over 5,000 flights every day through eight domestic and three international hubs and flies to all six inhabited continents.